Sedative; Relaxant; Anxiolytic; Treatment for cramps and painful periods; Migraine Treatment. 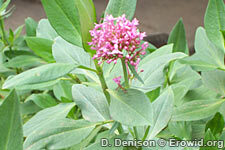 Valerian is an herbaceous perennial, with a strong, fetid smell. The stem is erect, grooved, and hairy near the base, and sometimes branched above. It bears four to eight pairs of leaves. The dark-green leaves are sometimes divided more than once. The pink-tinged flowers are small and tubular.